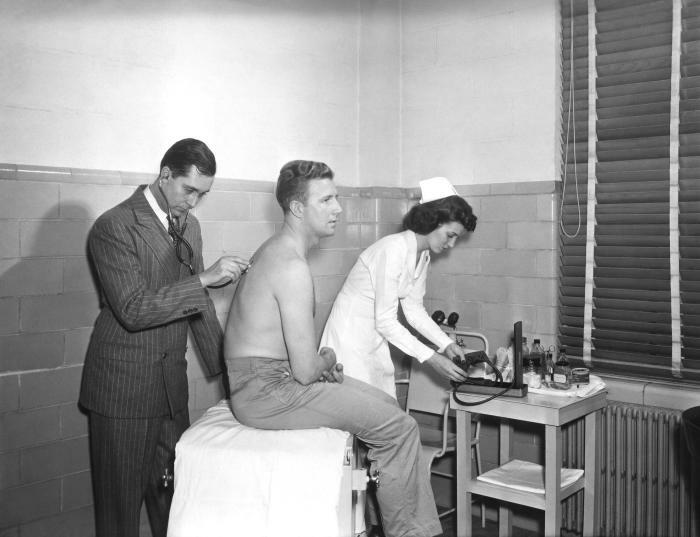 This 1950s historical photograph was provided by the Center for Disease Control's (CDC), National Institute for Occupational Safety and Health (NIOSH). It depicted an industrial plant physician and nurse, as they were examining a plant worker. The doctor was using a stethoscope in order to 'auscultate' chest sounds emanating from the worker's chest cavity. The nurse was preparing to take the worker's blood pressure reading using a device known as a 'sphygmomanometer'.